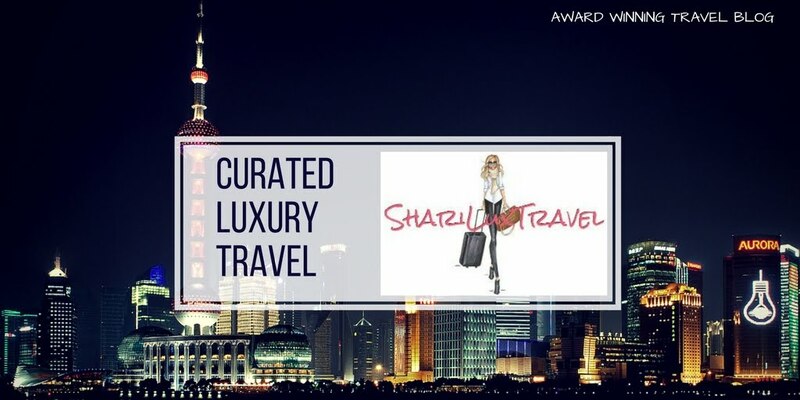 Tired of the ho-hum predictable hotels for your vacation? 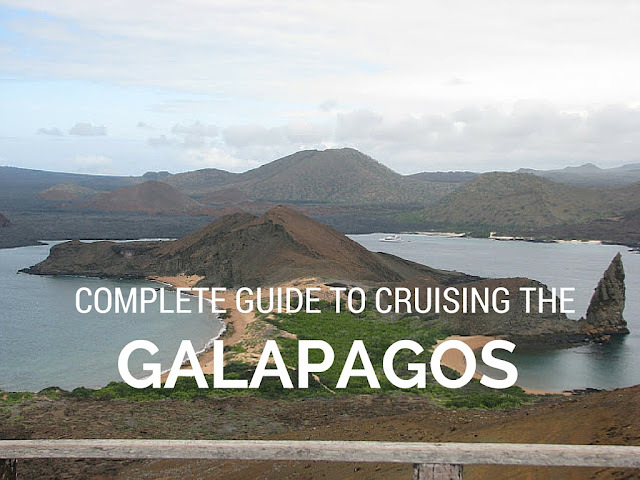 Step out of your comfort zone and try something unforgettable. Here is a collection of 8 truly unique hotel experiences around the world. 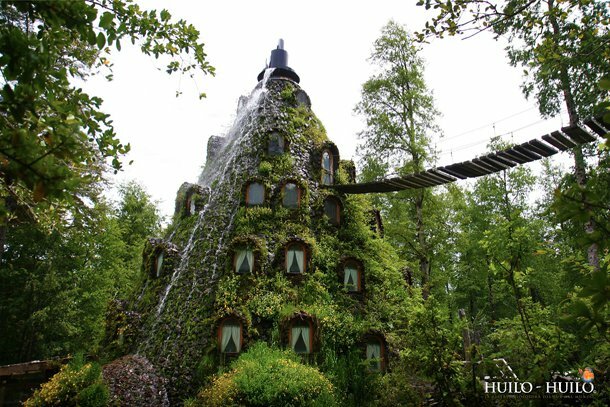 Magic Mountain Hotel or Montaña Magica Lodge is located in Huilo Huilo nature reserve in Chile and it’s spectacular. 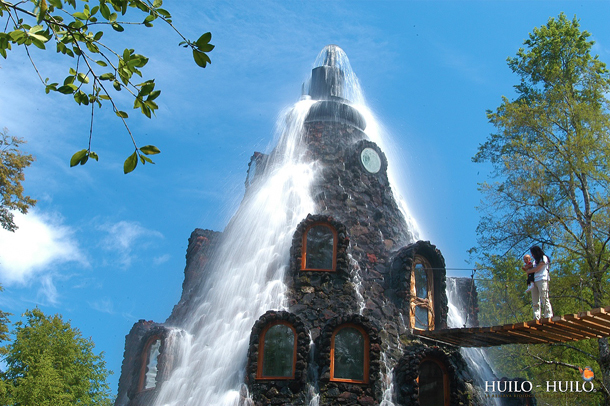 The 13 room hotel was designed after a volcano and has water falling from the top sliding down the windows. 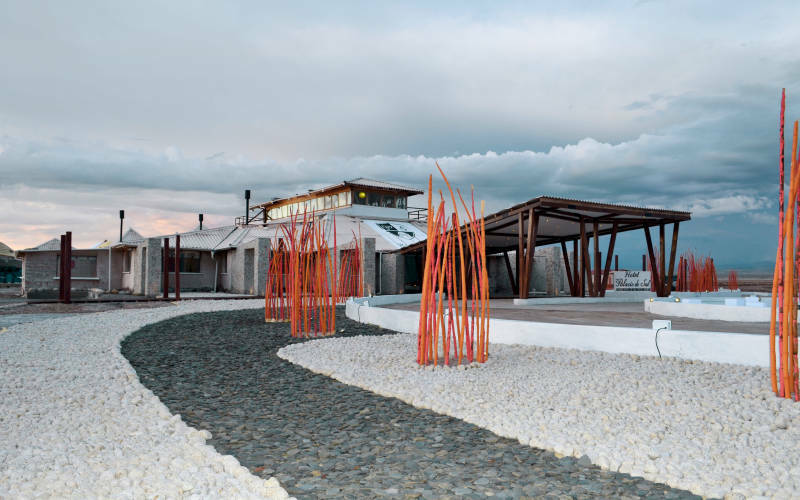 The combination of nature and man-made facilities will give you both comfort and a unique experience with nature. Guests can choose from a room named after local species of birds and plants. Visitors enter the establishment on a suspended rope bridge and are greeted by a cascade of water coming down from the cone shaped green roof. 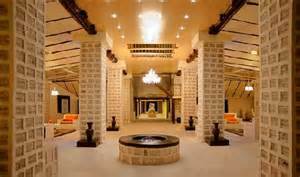 Amenities include a bar, restaurant and sauna. 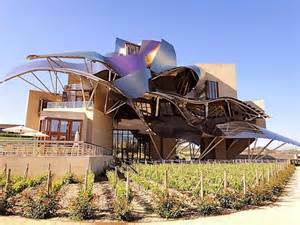 Hotel Marques de Riscal in Elciego, Spain is a grand luxury five-start hotel, originally built in 1858 as a winery, was re-designed by Frank Gehry into a City of Wine. 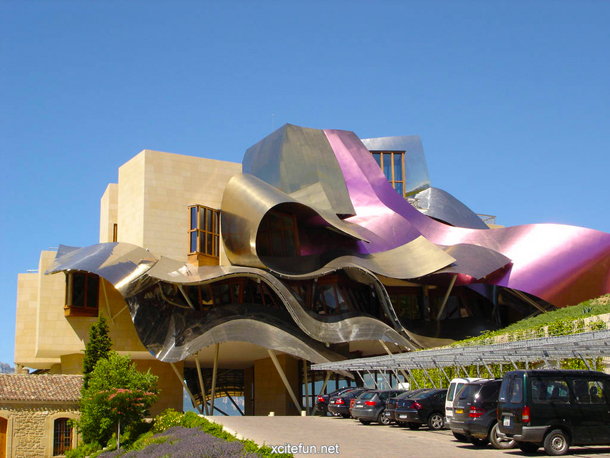 Ribbons on gold and purple engulf this luxurious property as a must-visit for art-lovers seeking a contemporary retreat where design, art, gastronomy, wine, and gorgeous greenery blend seamlessly to leave a lasting impression. 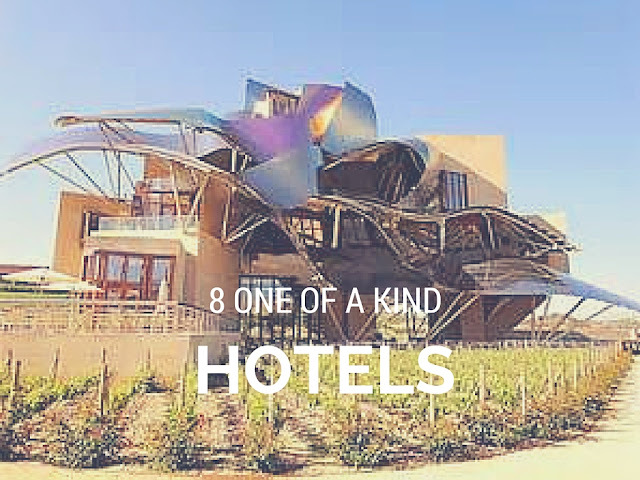 Hotel Marques de Riscal is a work of art with its inclined walls, zigzag windows, and cathedral-height ceilings. You’re in for a salty treat with the Hotel Palacio de Sal Built at the edge of Salar de Uyuni, the world's largest salt flat in Bolvia, the entire hotel from the walls, floors, ceiling, to most of the furniture – such as the chairs, tables and beds – is constructed in salt. 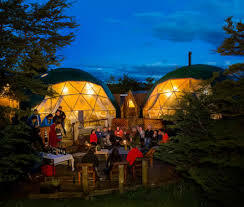 Built in 1999, EcoCamp’s unique hotel rooms are Geodesic domes patterned after the ancient Kaweskar tribe’s huts in Patagonia. Surrounded by lush flora and striking granite peaks, EcoCamp offers guests a breathtaking view of the Torres del Paine at sunrise and sunset. 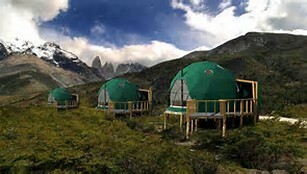 All domes are immersed in nature, resistant to the Patagonian elements and have ceiling windows to look up at the starry night sky. Nestled into the island’s cliffside, the 13 dwellings consist of one- and two-bedroom cottages, plus suites and a splurge-worthy four-bedroom villa. 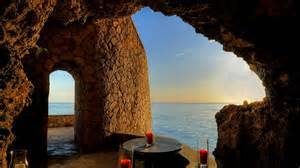 The Caves’ onsite restaurant offers amazing different settings, from an oceanfront gazebo to a stone table at the cliff’s edge or even inside a private, candlelit cave. The world’s first hotel built of ice and snow, the ICEHOTEL is located in a small village in northern Sweden. 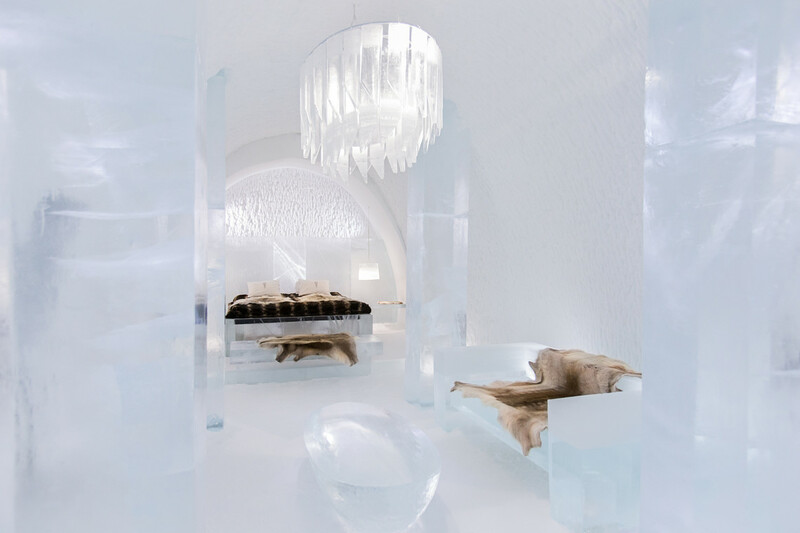 Featuring 5,500 square meters of space, there are 65 rooms divided into deluxe suites, art suites, ice rooms, snow rooms and group rooms. The hotel is constructed every year between November and December and is open to the pubic starting December 11 through April. At the end of the season, the hotel melts and the ice returns to where it began, the Torne River. The ice rooms, at a standard -5 degrees, come with fur blankets and a “survival course” so you stay safe and warm. "Warm" rooms are also available. The 10-acre beachfront property, is located in the Gandoca-Manzanillo Wildlife Refuge on Costa Rica’s southern Caribbean coast in the Limon provence. 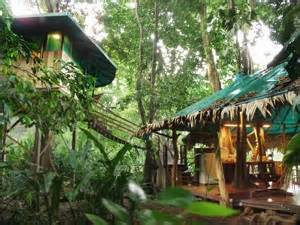 Built in and around a 100-year-old Sangrillo tree, the Tree House Lodge is filled with sustainable, hand-carved furniture and gorgeous birds of paradise flowers. Stroll across the suspension bridge to your private bungalow in the trees and immerse yourself in the Costa Rican jungle. Features include solar heating, two bedrooms, a kitchen, and a shower. 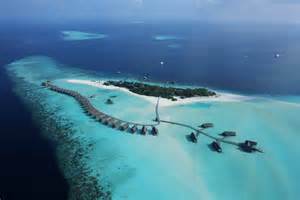 Cocoa Island is a an intimate private resort of 33 “overwater suites.” Each villa is built along a dock to allow visitors to jump right into the water from their front door. And the water could not be more inviting.